DIY Wedding Dress Necklace Tutorial: Use a tiny piece of your wedding dress to make this quick and easy pendant. Looks gorgeous and a great thing to do with your dress after the wedding! This post is one of the main reasons I actually started a blog. There is a pin on Pinterest that I have seen a million times, but I cannot find a tutorial for ANYWHERE. It’s the beautiful necklace that preserves a piece of your wedding dress for you to always wear. Yes, you have seen it (and probably pinned it hoping to make it one day). But unfortunately, there are zero tutorials for how to do this, and while you can pay $40-50 for someone to do it on Etsy, that is inconvenient and way expensive. So I decided I would make my own tutorial! And even though it has taken me forever to get it up, I am finally doing it! Now I know it can be hard to cut your wedding dress (just ask me, I actually did two years ago! ), but this necklace only requires a tiny piece and are you really ever going to wear your dress again? I personally decided that I could save my veil for my daughters to wear on their wedding days if they want because even though my dress was perfect, I am sure it will be out of style in 20 years. So this is a much better use of my dress! I am SO HAPPY with the way this turned out! This project has been something I have wanted to do ever since starting my craft blog and cutting up my wedding dress. I love wearing it, and I love that it is a reminder of the love I have for the Mister and the promises we have made to each other. And I love getting to tell people that it is made from my wedding dress!! And before you get overwhelmed and think “I can’t do that! It’s too hard!” I just want to tell you that this took me about 10 minutes to make. So no matter what your craft skill level is, you can make this!! First, you will need to remove any beading or detail on your lace. Mine had some sequins and beads sewn on, so I just used a seam ripper to take them off a small part of the lace (and I saved the beads for another project!). Then cut out your pattern. Just a quick tip, don’t stick your pattern inside the pendant tray to make sure it fits. It will get stuck and you will be in trouble. Next, you will want to decide what part of the lace you want to be seen through the glass stone. Just lay the stone on the fabric until you figure out where you want it. Then place the pattern on that same part of lace and cut around it. You don’t want to actually trace the circle onto the lace because when you go to glue the lace, the marking will bleed and be visible through the stone. Trust me, you don’t want that. 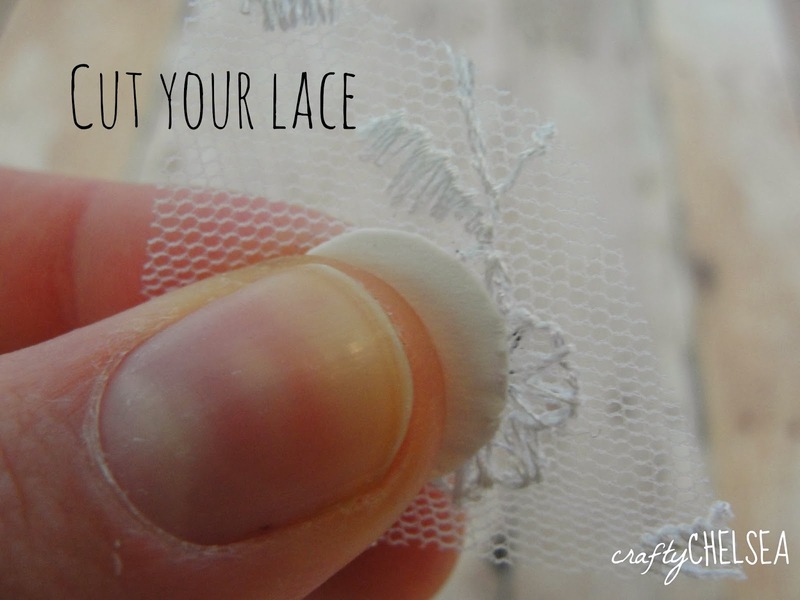 Just hold the pattern onto a small square of your lace and cut around it, careful not to move the pattern when you turn the lace around to cut the edges. Now you should have a perfect little circle of lace for your tray. The next thing you will want to do is make sure that your fabric will fit inside the pendant without poking out at all. Put each piece in separately and then place the stone on top. If it is too big, you will be able to tell. Then you can trim whatever needs to be trimmed. Now grab your FabriTac adhesive and put a small dab on the back of the glass stone. 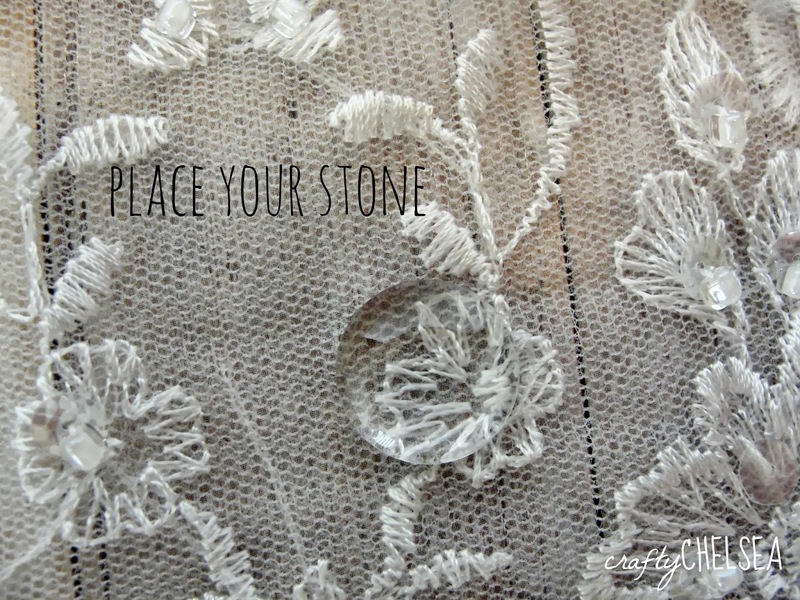 Press your lace onto the stone (your hands will get a little glue-y). Then place another small dab of FabriTac on the back of the lace, and then press the stone and lace into the pendant tray. Squeeze tightly so you get out any bubbles! You may get a little glue on top of the stone, so wipe it quickly with a wet paper towel before it dries. Guess what! You now have a beautiful pendant charm made out of your wedding dress that you can wear on a necklace! Also, as a side note, it took me forever to find a chain small enough that it would fit through the hole of my charm. I couldn’t find one at Jo-Ann or Michael’s, so I finally just ended up getting one off of Etsy. I had to send the charm in to her so she could put it on the chain, but it was worth it!! Also, on a completely different note, I just got an Instagram!!! Yay! So you should find me and follow me @lifewmylittles and it will be wonderful. Thanks everyone! And if you want something else to do with your wedding dress, check out how I made a bracelet for my daughter’s baby blessing here! THANK YOU so much for posting this tutorial! I’m trying to put together a necklace for myself as well as one for my mom with pieces of my wedding dress, hers, and my grandmother’s. This is going to make it possible! You are so welcome! I am glad I could help! I love my necklace, and I’m sure you and your mom will love the ones you make! Thanks for posting! I can’t wait to make my own! Oh my goodness, you are totally right! I didn’t mention it! Now that I think about it, I think when I did the E600 it wasn’t as clear as the FabriTac, so I just used the FabriTac for the whole thing. I fixed the materials list in the post. Thank you so much, and I hope yours turns out great! I’m pretty sure I used a 14mm tray. You don’t want to go much smaller than that! That’s adorable, and so easy to make too! It’s a bit disappointing to put your dress away after the ceremony, but this way, you can carry a little piece of it with you everywhere you go. Thanks for sharing! Thanks, Heather! It’s definitely a special keepsake you can make! Hi Chelsea, I’m trying to make one of these with some vintage wool cloth. The spot of glue shows through the material. Have you had this problem? I’ve never used vintage wool cloth, so I can’t say that I’ve had that problem! Sorry! Wondering if you’ve had any issues with the lace turning yellow after a few months. I did this, but with diamond glaze glue and it turned the lace yellow. Will using fabri tac ensure this doesn’t happen? Mine is still looking white years later, so maybe it was the glue you used? Oh I love that idea! That will be so special! I used the link to look for the locket, but couldn’t find it. Could you help me? You might want to send her a message and see if she has any available! I love this idea!! When you put it together was there no backing between the two stones? Just stone, lace, and stone? Thanks! But I’m not sure what you’re asking! There was only one stone. Inside the pendant I did a layer of the lace and then the stone.